Before the season started I wrote a lengthy post with my projections of NBA season win totals and I picked what I thought were the best over/under and prop bets for the season. Before reviewing those in particular, I thought it would be fun to compare my picks to some media guys that also made predictions prior to the season. Chris Herrington (regular guest who writes easily the most intelligent Grizzlies commentary on his blog and also writes about movies, music and the Grizz for the Memphis Flyer newspaper, @flyergrizblog). I also tracked the picks made by Bill Simmons (@sportsguy33) and his buddy Joe House (@housefromdc) on the BS Report podcast. They weren’t using lines but made win predictions, which I simply converted into over/under bets with the same lines used by the Memphis guys. (The Memphis lines are a bit different than the ones I used before but all of the differences cancel out and there is no overall change in my final results). So who was the best at picking over/unders? Among the media guys the best are Jon Roser and Bill Simmons, each with 19 correct and 11 wrong! I tied them with 19 correct. Chris Vernon and Joe House were close at 18-12 and then there is a HUGE gap until Chris Herrington at 13-17. But it really is a crapshoot in so many ways. There were only 2 lines where all 6 of us had the same pick. We all picked Detroit over 20.5 wins and were correct when they won 23 games. And we all picked Atlanta under 35.5 wins but they won 40. Which is especially amazing considering Al Horford missed most of the season and I would put him right there with Josh Smith as the best player on the team. I was off the most on Indiana. I picked them to win 29 games and they actually won 42. But I nailed 4 exactly right – Milwaukee with 31 wins, Boston with 39 wins, New Orleans with 21 wins and the LA Lakers with 41 wins. Looking back I should have have been smarter about realizing the impacts of the short season. I’m referring mostly to what appeared to be a compression in the results where no one was really really good or really really bad (except Charlotte). Simmons and House correctly anticipated this effect. I picked Oklahama City over 48.5, for example, and Sacramento under 17.5 wins and both were closer to the middle than I thought. But I was proven right about Dallas, which was massively overhyped even with the loss of their most important player, Tyson Chandler (that’s right, not Nowitzki). 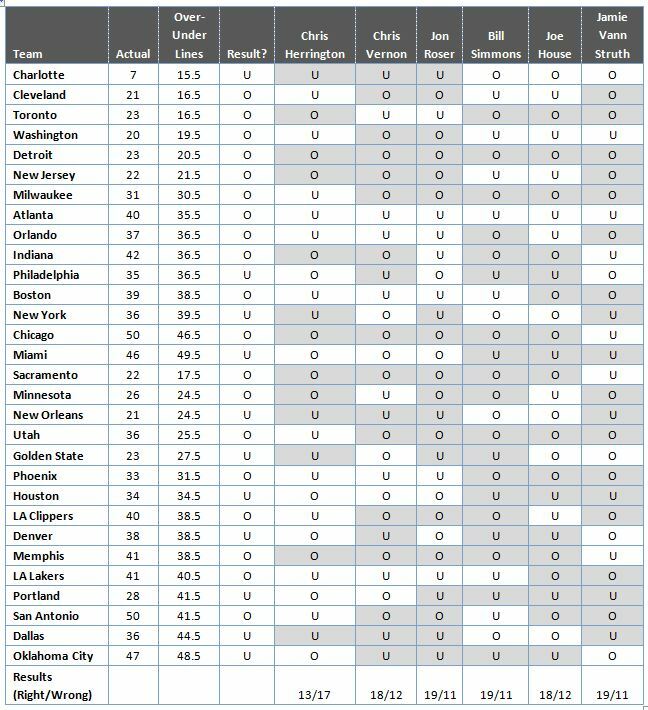 I predicted 34 wins whereas Simmons picked 45 and House picked 48 and they actually won 36 games. The over/under line was 44.5 wins which I thought made it one of the easiest bets on the board. My slam dunk pick was Cleveland over 16.5 wins and it looked fantastic through the early part of the schedule. The Cavs went over by winning their 43rd game, improving to 17-26. But with injuries to Anderson Varejao and Kyrie Irving they really cratered later in the year, going 4-19 the rest of the way. So with 21 wins it doesn’t look quite as impressive in the end, even though the bet was settled with over a month to go in the season.